College basketball in the state of Oklahoma was owned by various schools throughout the years. Oklahoma State under Henry Iba had a say in the state mostly from the late thirties through the early fifties with the Oklahoma Sooners breaking through some in their Final Four team in the middle forties. Oklahoma City University began a heavy hand in the state from the early fifties through the early seventies, where the Chiefs made eleven NCAA tournament appearances and was recognized as the leading Independent team of the Midlands/Midwest of the country. Oral Roberts University out of Tulsa was a national powerhouse in the early seventies under future OCU coach Ken Trickey, with some of the best players in the country. The Chiefs never made a Final Four appearance, but did come as close as one game, twice. The first flirtation with a Final Four team came in the 1956-57 season when they played for the Midwest Championship against the Kansas Jayhawks in Dallas, Texas. OCU and Kansas would be a battle of big men. Both had All-American centers, both tall and talented, one more than the other. 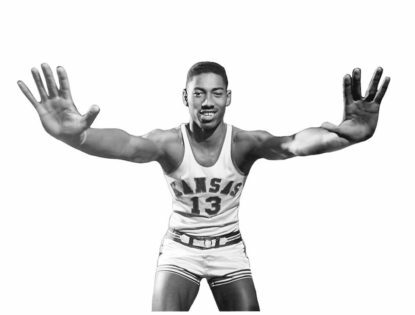 Kansas was led by one of the greatest basketball players of all time, the incomparable Wilt “the Stilt” Chamberlain. Chamberlain would play two varsity seasons for the Kansas school before leaving to play a year with the Harlem Globetrotters before his introduction into the NBA as of rules of the Association. The Chiefs had a big man too, a six ten giant out of Capitol Hill High School in Oklahoma City, Hub Reed, a junior. Not as tall as Chamberlain (seven one and one/sixteenth), Reed had developed into a premiere college center that would transform into a starting center in the NBA in time. Reed would be drafted in the second round after the 1957-58 season. Chamberlain was drafted a year later in 1959 after that one year with the Globetrotters, a first round pick, the number three selection. The game would be noted for more than just the score and winner. It would begin a relationship that would last a lifetime between Chamberlain and Reed, and end with Wilt’s passing years ago. The time, setting, and significance of the game should never be forgotten, as this was a game more of respect and not of athletic endeavor. The greatness of any player that made a mark in the NBA after college is a given, and with both of these two young men, they were in fact to participate in a historic battle of the paint, but more importantly a bonding of men that skin color did not count for crap. Reed was one year older than Chamberlain at 21 at game time. OCU, again in 1956, was loaded with great players, all white, as the black influence was still a couple of years away. Coach Abe Lemons was in his second year at the helm of the Chiefs, as Doyle Parrack, who built the program, moved down to Norman to coach the Oklahoma Sooners. Lemons squad would use his talented center Hub Reed as a power but also a finesse scorer in the post . Reed would average over 22 points a game in his two years at OCU. Like Chamberlain, unstoppable on offense, Reed was also an outstanding rebounder in a college game using his advantage of quickness and height. Reed was not just good, he was All-American good at a time when a six foot eight, nine, or ten player was considered not just tall, but extremely tall. Reed was a very finished player as was Chamberlain at the time of there meeting. Chamberlain was not only the strongest player in the world as a college sophomore, he was the most athletic, and he pushed two hundred forty pounds. Wilt’s physical statistics are all-world, even as a college player. 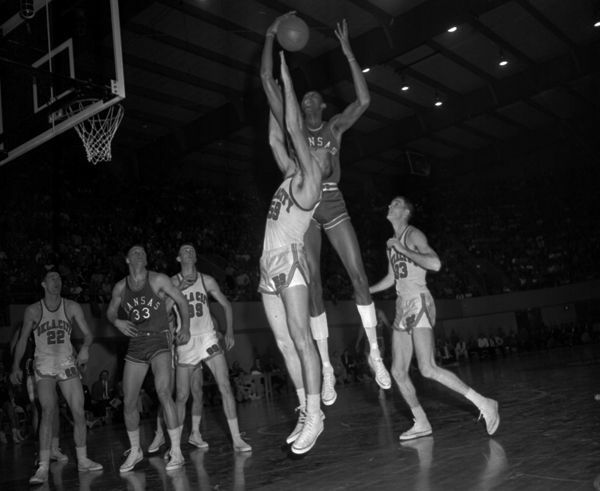 Both Wilt and Hub, in 1957, could score on anyone in any league, college or professional. By today’s standards, they would be one and done in the college. As one might imagine, Dallas was not enamored with having Kansas in town for the Midwest Finals as ugly racist whites of northern Texas would again come out in large numbers to hurl insults at Chamberlain in the second night at the NCAA’s Midwest site. Moody Coliseum was a new facility and the eight thousand fans were not going to pull for Kansas and their black center. Chamberlain had spent his first varsity season in Lawrence dodging racial insults at all the various sites Phog Allen had taken his Jayhawks to play. It was especially bad at on the road in conference games in places like Manhattan, Norman, and Columbia. Other field houses in the Midwest part of the country were just as unkind. Not only the fans were trouble, Chamberlain was called everything imaginable from his opponents. Mostly under their breath, but sometimes not so hidden, the words of “ni–er”, “c–n”, “j-g-a-b–” were heard from players that had to play against him. Most all teams that KU played in the Midwest part of the country did not have the black player on their squads in 1957. Only some socially advanced schools on the east and west coasts were integrated. Some places such as Texas at Austin and Kentucky at Lexington would be lily white for another ten years. As for the game, Kansas and OCU played a good traditional first half with an insulting crowd being assholes toward the Kansas center from the time he stepped on the court. OCU’s coach Abe Lemons was not happy with the officiating (what’s new) and complained that Chamberlain was getting his way on the court and his Chiefs were at a disadvangage. The crowd played into it, as the Chiefs were the team they cheered for. Lemons, even with a hostile crowd wanting nothing more than see Wilt carted off the court, would not qualify the racists watching as he had the officials to worry about along with the best player any team of his would ever play. On court was a different story. Reed would apologize to Chamberlain about the behavior of the southern red-necks that were totally out-of-line. This was new to Chamberlain, as Reed, and played a strong but complimentary game that night, showing total sportsmanship in his duel with the National Player of the Year. At the end of the contest, Kansas was too strong and pulled out an 81-61 victory, sending the Jayhawks to a more friendly Kansas City for the 1957 Final Four. As for stats, Reed’s 29 points and 13 rebounds were just a little less than Wilt’s 30 and 15. Reed and Chamberlain met many more times on a court in the NBA. Sure, Reed was a bench player and only started a couple of seasons for the Cincinnati Royals, and Wilt was the most powerful offensive player of any time (excuse me Shaq). Let’s not forget that there were only nine teams in the Association in the late 50’s, making Reed one of top twenty centers in the world. Wilt and Bill (Russell) were one and two in any order and that is not for discussion.